Josh Holloway as James "Sawyer"
James Ford, better known by the alias "Sawyer" and later as "Jim LaFleur", is a fictional character played by Josh Holloway on the ABC television series Lost. Sawyer was born on 18 February 1968; he was initially portrayed as a conniving, sarcastic handsome flirt who keeps stashes of washed-ashore items. His flashbacks typically depict a more sensitive side to him, juxtaposed against acts of betrayal and theft. He has a romantic interest in the fugitive Kate Austen (Evangeline Lilly), and the two fall in love over the series. Their relationship is particularly prominent in the beginning of the third season. In the fourth season he develops a more heroic side, becoming protective of Claire Littleton (Emilie de Ravin) and sacrificing his chance to escape so his friends can in the season finale. In the fifth season, Sawyer quickly acclimates to his new role as group leader as they are sent back through time, and after being without Kate for three years, falls in love with Juliet Burke (Elizabeth Mitchell), creating a love triangle when Kate returns to the island. Sawyer is the show's primary anti-hero. 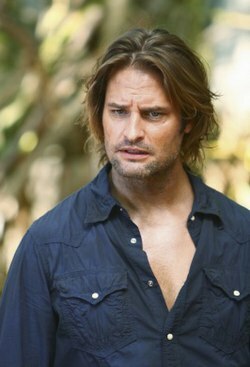 Sawyer was born in Jasper, Alabama in 1968 as James Ford. When James was nine years old, his parents were conned by a man under the alias of "Tom Sawyer"; as a result, his father killed both his mother and himself. On the day of the funeral, Jacob expresses his condolences to Sawyer, even as he is writing his 'I am going to find you' letter for the conman who took his family. At the time of his parents' death, James and his family were living in Knoxville, Tennessee according to the letter Sawyer carries. James also claims to have dropped out of high school in the ninth grade, but has a "high school transcript." A major driving force in James' life is his vow to avenge his parents' deaths by hunting down the original Sawyer; as an adult, when he found himself in financial difficulty, he adopted the profession and alias of the man responsible for his parents' death, using his looks and charm to seduce wealthy married women, thus he "became the man he was hunting." One of his scams involved waking up next to his victim and pretending to be late for an important meeting; as he rushes to get ready, his briefcase will "accidentally" spill open, revealing bundles of cash the woman "wasn't supposed to see." With her interest piqued, he convinces her and her spouse to invest cash in a legally questionable, but supposedly lucrative business opportunity, before disappearing with the money. On one occasion, he runs this con up until he discovers the targeted couple has a child, experiences an attack of conscience and cancels the deal.